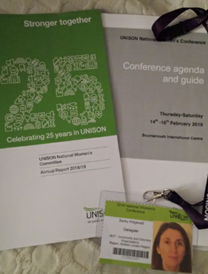 It was my first time to attend a Unison Conference. 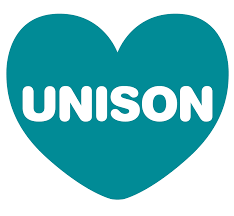 I felt very well-looked after as a newbie and felt much gratitude at being given this opportunity to get more involved with the work of our union which I passionately support from a grass-roots level of being a work place rep. It was a packed agenda with around 40 motions to be discussed and voted on which seemed a lot to get through. But the debates were very rich and well outlined so every motion was brought to life with passion from fellow delegates. Motions on period poverty, WASPI women, transphobia, universal childcare, black women in senior positions in the workplace and domestic violence were all discussed and passed. All motions that were passed will go on to the National Delegates Conference. The conference was a time to meet other delegates and celebrate our achievements as a union as well as pass motions for the future. The union has 1 million women members and this is still growing. 18,000 new members joined during the Growvember event last year – which equaled the biggest recruitment within in Unison during any month for 25 years. As a workplace rep who held a Growvember event I felt proud to be part of this. To sum up: attending Unison’s National Women’s Conference this year in Bournemouth was truly inspiring and a great way to be initiated into the inner workings and democracy of our union. It’s not often that we as activists get to spend quality time with like-minded activists who do the same supportive but often stressful work for our members, let alone spend time in a hall with several hundred amazing, inspiring left-wing women.